Liverpool Hospital is located in the south-western suburbs of Liverpool, New South Wales and is 45 minutes away from the Sydney CBD. It is the largest hospital in New South Wales and one of the leading trauma centres in Australia. It has a maximum capacity of 855 beds, 23 operating rooms and 60 critical care beds, diagnostic and imaging services, emergency and trauma care, maternity, paediatric, cancer care, mental health, ambulatory care, allied health and medical and surgical services from birth to aged care. The Hospital is the major health service for south-western Sydney, providing services to residents from south western Sydney and visitors in the area. It also provides a range of statewide services in areas such as critical care and trauma, neonatal intensive care and brain injury rehabilitation. 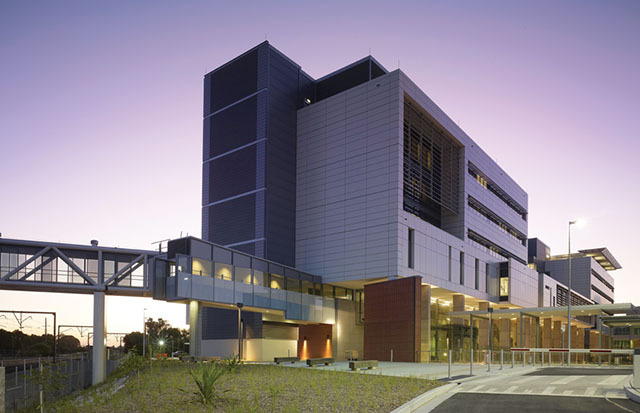 Liverpool Hospital sits within an education and health precinct which includes the Ingham Institute of Applied Medical Research, South West Private Hospital and South Western Sydney TAFE. It is a principal teaching hospital of UNSW Australia and the University of Western Sydney and continues to have an active education programme for medical practitioners, nurses and health professionals, with a range of clinical placements available for students from universities around Australia. Use Entrance A on the corner of Elizabeth and Goulburn Sts for access to the Education Centre and the Clinical Skills and Simulation Centre. Uniwide is available in the Education Centre, Clinical Skills and Simulation Centre, Library and Student Common Room. The Common Room, adjacent to the Ken Merten Library, also includes computers, television, kitchenette and lockers and can be accessed using swipe cards or the keypad at the door with the code which School staff can provide. Students also have access to UNSW computers and photocopying facilities in the Library. Liverpool students will be issued with Hospital identification as part of orientation. Students must wear the ID at all times while in the Hospital. Limited and expensive ($24/day) parking is available on site. Students can access free (for less than 3 hours) parking in the Liverpool Westfield Car Park which is one block west of the Hospital campus or use street metered parking or the nearby Warwick Farm commuter car park. A Transport Access Guide for the Hospital outlining local bus routes is downloadable below. Students should use http://131500.info/ to plan the trip from Kensington or home and ensure they allow ample time for the walk to the Hospital.